When one embarks on a hunger strike, effectively you sentence yourself to death and you hope for a reprieve. And that reprieve will be if conditions are met, or if you fail or break along the way. If you fail or break along the way, it can be very damaging to the individual, to their own self-esteem, to their own confidence and what they stand for. In our case, conditions were so bad that to continue what we had been enduring was out of the question. Since the attempted burning of the prison and the continuing solitary confinement and the brutality associated with strip-searches, it became unbearable. There are fates worse than death, and certainly in my opinion, and from my feelings at that point in time, to go on and be destroyed by what we were enduring was unthinkable. Our only choice was to fight back and place our starving bodies against the power of the state. That was our only alternative as I saw it. In order to maximise the chances of a hunger strike succeeding, it is necessary to build a public awareness campaign around the issues involved and hopefully generate sympathy and support behind those taking part in the protest. Because of restrictions on visits, censorship of letters in the prison, censorship in the media outside and a generally subservient and unsympathetic press, it had not been possible to promote awareness and focus public attention on the worsening situation inside the prison. The political climate was another factor which militated against their chances of success. An atmosphere of fear had gripped the country during he period of the Fine Gael/Labour Coalition Government. The introduction of a state of emergency and the Emergency Powers Bill in the middle of 1976 gave the Gardaí extraordinary powers. This allowed them to hold suspects for up to seven days for interrogation before charging or releasing them. Supplementing this attack on civil liberties were the unorthodox actions of certain élite Garda gangs who employed physical torture to extract confessions from suspects in custody. Under another bill planned for introduction — the proposed Criminal Law Bill -- plans were also afoot to impose almost complete censorship on the media. This was dramatically exposed when the distinguished Washington Post journalist Bernard Nossiter informed Tim Pat Coogan, then editor of the Irish Press, of the contents of an interview he had had with Conor Cruise O'Brien. In this interview O'Brien produced cuttings of letters to the editor from the Irish Press and indicated that he intended to take action under the Criminal Law Bill against editors who published such letters. Coogan subsequently published strong editorials in which he outlined and exposed O'Brien's impending attack on the freedom of the press. In consequence, the Criminal Law Bill was undermined and diluted somewhat. What this demonstrated was that it was politically unacceptable for the press to be intimidated overtly. However, the press in general, with a few notable exceptions, did succumb to governmental pressure and turned a blind eye to abuse of power by the coalition government and state agencies such as an Garda Síochána and the prison administration. The treatment of republican prisoners in Portlaoise Prison and republicans, nationalists and civil libertarians throughout the country was all but ignored by the press. These factors taken together combined to generate a climate of fear throughout the country. Conor Cruise O'Brien, as Minister for Post and Telegraphs, wielded considerable power over the media. He was fully supported by his colleague, the Minister for Justice, Paddy Cooney. Together they were the main architects of these measures. When all these factors were taken into account, the prisoners realised that whatever action they took they would be starting from the weakest possible position. Inside the prison, the IRA prisoners discussed their position long and hard and expressed their doubts and fears. Some had serious reservations about the prospects of a hunger strike succeeding. So desperate had the situation become, however, that to allow conditions to continue as they were without confronting them as a unit would almost certainly lead to individuals taking the initiative. In any case, the prisoners knew that stepping back now would only serve to postpone the inevitable and prolong the agony of the suffering prisoners. Reluctantly, the IRA within the prison sanctioned the hunger strike. The IRA leadership outside were informed of the decision and tried in vain to persuade the prisoners to abandon this course of action. On 6 March 1977, Martin Ferris was one of 20 IRA prisoners who began refusing food. His school pal from Barrow, Danny O'Sullivan, and Brendan O'Doherty from Currow were also amongst them, as was Bobby McNamara, who had been arrested with Ferris and O'Sullivan in Youghal. 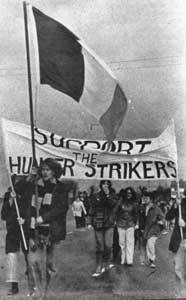 Two of the hunger strikers, Kevin Mallon and Dáithí Ó Conaill, were also designated as negotiators, with the authority to agree terms for ending the fast. Ferris believes it was a mistake to include negotiators amongst the hunger strikers. It was too much to ask them to participate while acting as representatives for the prisoners. Nelson Mandela said: "Only free men can negotiate. Prisoners cannot enter into contracts." The central demand in Portlaoise was for a public enquiry into conditions inside the prison, which, it was hoped, would lead to a general improvement. Ten days after the fast began, the governor had the 20 hunger strikers moved to one side of E1 landing. Conditions similar to those in solitary confinement were imposed. The prisoners were in breach of the prison rules by refusing food, so, technically, the governor was within his rights to isolate them. From the humanitarian point of view, one can judge [Portlaoise Prison Governor] O'Reilly for oneself. This was to be the first time, in this phase of the struggle, that fasting prisoners in the 26 Counties were deliberately isolated for the duration of a fast.